Less than 12 hours after the press conference in which former Shas chairperson Eli Yishai announced his new Yachad party after 30 years in the Sephardic-hareidi party, Shas appears to be in a panic on Tuesday following the release of a new poll showing Yishai took half of their electorate power. The poll, conducted by Panels Politics for the Knesset Channel, found Yachad and Shas would each receive four mandates in coming March 17 elections. A senior Shas source told Arutz Sheva that he earnestly hopes the poll results will not be indicative of the actual election results. "At this pace we are liable to disappear from the political map," said the source, saying it likely was a mistake to press Yishai out of the party. Yishai's split came after his rival and current chairperson Aryeh Deri gave him steep demands for being able to stay such as needing permission to hold interviews, with Yishai demanding some actual authority and influence. 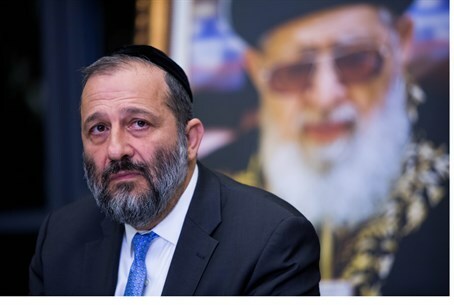 The source added "I hope for Aryeh Deri that he will succeed in leveraging the social campaign and the new image he is trying to give the movement. That's okay, that's right and it should be like this, the question is whether it all won't be for nothing due to Eli Yishai's running." "Aryeh Deri needs to go down to the public, to connect to the public," said the source. "It can't be helped. Eli Yishai was connected to people. The public loved him. I expect Aryeh to internalize the new situation. We are definitely in a problem." Deri and Yishai have been rivals since Deri returned to politics taking back leadership a year-and-a-half ago after a stint in jail for corruption, followed by a lengthy period in the political wilderness, during which time Yishai took over the reins of the party. The two are divided in terms of outlook, with Yishai being considered right-wing and Deri leaning increasingly leftward. Ahead of the recent split, Deri was revealed in private conversations to have made harsh comments against Yishai, saying "I don't need him (Yishai), he just bothers me. We offered him what we offered him out of mercy." The acrimony due to the party's split was even more apparent after recordings released Monday revealed that Rabbanit Adina Bar Shalom, the eldest daughter of Shas founder and mentor Rabbi Ovadia Yosef ztz”l, attacked the party head in a private conversation, saying "I do not think Deri is conducting himself in the right way." That, despite the fact that Bar-Shalom had appeared in a public press conference with Deri just a day earlier, expressing her apparent backing for the embattled party leader.